Not if they call it FX Viagra, thank you. The FX 8350 is $60.00 more than the FX 8150. The price difference is about 30% higher; so does 30% price increase equal to 30% more performance? 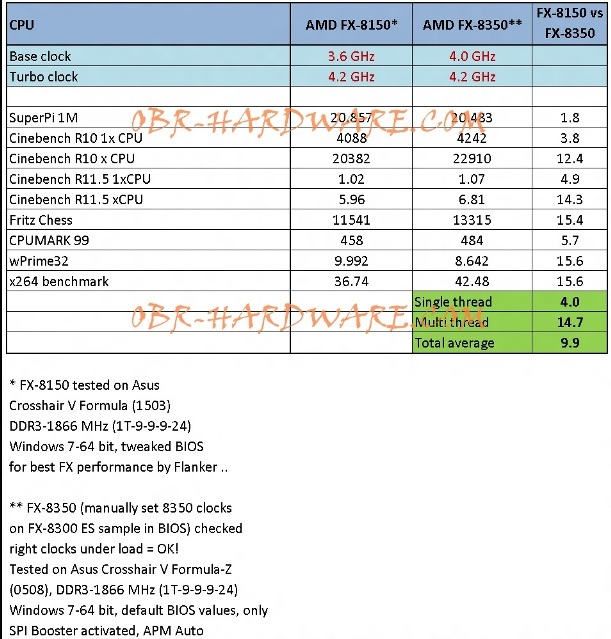 And what about some benchmarks at very minimum to qualify this cpu as a better option than the current FX model? Vishera sera, whatever will be, will be. wth, it's que sera, sera. and it will still be crushed by ivy bridge. and amd will "crush" intel's graphics offering, as if enthusiasts will buy ivy bridge for its hd graphics. amd needs to move fast and efficient for real competition to take place. we'll if the architecture is ~15% more efficient and it it has a higher frequency then maybe it can reach the 30% increase in performance. or can reach about 20% while consuming less power. we'll just have to wait and see. FX-8150 launch MSRP $240. Actual initial (r)etail pricing ~$280. The $253 for the FX-8350 may not represent AMD's MSRP since the prices are sourced from an online etailer. Basically you can't infer too much regarding the performance delta between the two CPU's based on such a paucity of information. As for benchmarks, you'll have to wait a few weeks for sanctioned reviews*. Scuttlebutt has it that review samples are already out to some reviewers with an official launch date approx. 18 October. *Preliminary testing with engineering samples is available on the net. One such thread is at OCN devoted to Coolaler's benchmarking. Be aware that the ES sample may differ in functionality to the retail samples. BIOS will also undoubtably be more refined on the shipping boards...hopefully the debacle of Bulldozer and the Asus Crosshair V with the Three Stooges Edition BIOS won't be repeated. Whatever the reviews bring, you can bank on only two sure outcomes- that Intel trolls attempt to turn every review forum into a repository for fail gifs and SuperPi benchmarks, while AMD trolls petulantly rail against the Intel compiler conspiracy, and vow (on AMD's behalf) supremacy for some future yet-to-be-defined Sunnyvale CPU. Rumors has it that Vishera will gain 50% IPC improvements after a Windows Patch and a hotfix. I've heard it stated (as opposed to rumoured) that by the time AMD has three revisions of Bulldozer µarch out, IPC will have increased by 400% , that is only a matter of time before AMD crushes Intel, and that AMD's apparent missteps -late to market/dodgy execution etc., are just pieces of a cunning plan to lull Intel into a false sense of security (R3D, SA, TPU).